I’ve got a strong connection to Brazil. Perhaps started from a young age when my dad mentioned I had Brazilian ancestry (guess you would be excited and curious too)! In 2009 I visited Brazil for the first time. It was an amazing experience especially to see friends I’d made in London who returned to Brazil. I kept my promise that I’d visit them one day soon in Brazil and I stuck to it (not the most difficult promise to make admittedly)! In 2010 I started a project inspired by my childhood curiosity of my Brazilian ancestry. Kai Li’s Tabom Project. I went to Ghana and interviewed the Brazilian Ambassador to Ghana and well as many elders from the Tabom community. 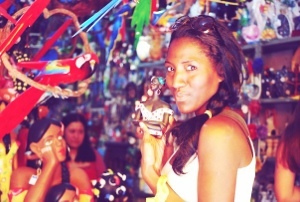 I am proud to say I have been able to trace my Afro-Brazilian ancestry to Salvador, Bahia! My research doesn’t stop there. I plan to compile together a book about my ancestry and the Tabom community in Accra (Brazilian descendant community). 2012. Once again I have kept my promise (this time to myself) to return to Brazil to further my research. I hope to spend more time in Salvador and the north of Brazil. Original and Ecological… The push pull purse! I saw this and thought… wow! I took a short trip in 2009 to Argentina by flying into Santiago, Chile, and taking a bus from there through the Andes to the lovely city of Mendoza. The journey was exciting (it not a bit scary at times through those tightly winding roads)! I had a great time in Mendoza visiting a winery and enjoying the night life… dancing away to reggaeton! I’ve booked a cheap ticket to Buenos Aires for January 2013! It was a lucky find (though I arrive at crazy o’clock)! This is great because it save me two days than travelling by bus from Brazil (Sao Paulo). I’m looking forward to my first trip in 2013! So based on Mauricio’s theory I’d be happy to re-visit Chile and see it in a different light. And he says they have the best Pisco Sour. That’s a good enough excuse for me! I’m taking BOLD leap by sub-heading Guyana and Suriname. I haven’t actually visited either of these countries. However I plan to in January from Salvador… by the cheapest way possible. Which is probably hitchhiking but no I won’t do that. I’m talking by bus. Unless I miraculously find a really cheap ticket… Stranger things have happened!